There’s no better place to feel the energy of the city than in Parque Central, the heart of Granada’s colonial grid. On any given day, locals can be found under the shade of the park’s lush ficus and mango trees. Though vendors and street performers often take the spotlight, the park is also home to vestiges of the past, including fountains and statues dedicated to noteworthy Nicaraguans like poet Rubén Darío. The eastern side leads to Plaza de la Independencia (Independence Square) and the vibrant pedestrian street Calle La Calzada, where you’ll find some of the city’s best bars and restaurants. From Parque Central, you won’t be able to miss the Catedral de Granada, which towers above the palm trees like a golden mountain. While the city is full of historical churches, this Spanish colonial structure dominates the skyline with its distinctive yellow and white bell towers and dome. 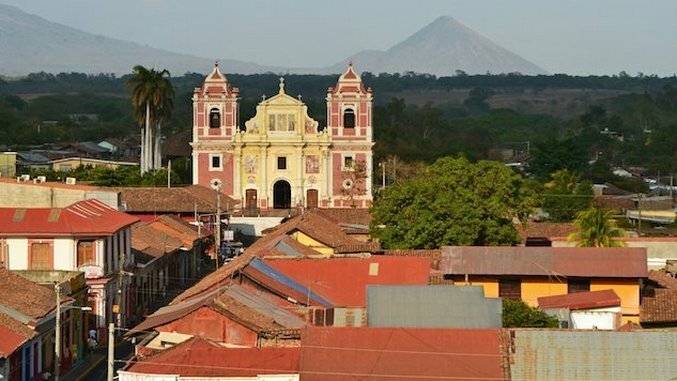 Though the original church was built in the 16th century, it was destroyed in 1856 at the behest of former Nicaraguan president William Walker. The current version was rebuilt by 1915 and features colorful mosaic tiles that are typical of Granada. A trip to Granada would be incomplete without a spin around Lake Nicaragua, which just so happens to be Central America’s largest lake. The body of water was once home to bull sharks that arrived by way of the San Juan River, but they haven’t been seen in years. What’s even more impressive are the 365 islets of Granada that were formed when the Mombacho Volcano blew its cone into the lake thousands of years ago. Today, the archipelago is a scenic spot for bird watching. While the city boasts its own set of accommodations, savvy travelers opt for the unique experience of staying on a private island underneath a tapestry of stars. Just a 10-minute boat ride away from the mainland, Jicaro Island Ecolodge has nine private luxury casitas (two-story little houses). As part of the Cayuga Collection, the ecolodge takes sustainability one-step further by working with local communities on water filtration and solar energy projects. For the average guest, the beauty is in the little details, like sipping a cocktail out of a bamboo straw or feasting on dishes made with local ingredients. With morning yoga with views of the Mombacho Volcano, followed by paddle boarding and sipping Nica Libres in the sun, you’ll be hard-pressed to find a reason to leave the island. Nicaragua is filled with various volcanoes, but Mombacho is arguably one of the most majestic. Made up of four craters shrouded by a lush cloud forest, the volcano is home to thriving plant life, monkeys, deer, reptiles, birds and more. The best part is that it’s located only 10 miles away from Granada, making a day trip completely feasible. Hiking options range from easy walks around the main crater to vigorous four-hour treks. Rumor has it Christopher Columbus first tasted cocoa in Nicaragua (although some say it was actually in Honduras). Regardless, a trip to Granada is made sweeter by sampling the country’s delicious, artisanal chocolate or making your own. The Choco Museo, housed in an old mansion, invites visitors to roast, grind and refine organic cacao beans into Mayan, Aztec and Spanish varieties of chocolate. By the end of this interactive workshop, you’ll leave with a hop in your step and the “Báte Báte Chocoláte” rhyme forever in your head. Stepping into one of Granada’s many cigar shops is an entrancing experience, to say the least. Inside these fragrant factories, you can watch the masters quickly roll tobacco, and even try your hand at it, too. Among the many family-owned cigar shops is Doña Elba Cigars, an award-winning manufacturer of premium private label cigars. Cigar aficionados will relish in the Blending Room, where you can design your own custom cigar. With several canopy tour options on the fringes of Granada, adrenaline junkies need not go far for a fast-paced adventure. As you zip line through the trees, you’ll likely spot families of howler monkeys training their young to swing through the branches in a not so similar fashion. For a truly out-of-this-world experience, zip line over Mombacho Volcano for a bird’s eye view of the lush cloud forest. Originally built in 1534, Iglesia de la Merced is one of the most architecturally stunning churches in the city. The cherry on top is its bell tower, which offers an expansive view of Granada. Head up the winding staircase at sunset to see the pastel city aglow during magic hour, a truly spectacular way to cap off a day in Nicaragua’s colonial kingdom. Awash with color, music and photogenic appeal, Nicaragua’s historical hub of Granada has a way of hypnotizing all five senses. It’s no surprise that the oldest colonial city in Central America is a magnet for shutterbugs and culture seekers. After all, its streets lined with pastel buildings, horse-drawn carriages and aromatic cigar shops make it easy to cast itineraries to the wind and simply wander. Even so, the city boasts a range of landmarks that even the most tenacious wanderers will want to cross off their bucket lists. Founded in 1524 by Francisco Hernández de Córdoba, Granada is ostensibly the first European city in mainland America—and has the colonial-era architecture to prove it. Over the years, the city contended with invasions from English, French and Dutch pirates trying to take control of the country. Today, the political unrest has subsided, leaving the town open for exploration. Located near Lake Nicaragua, Granada is conveniently situated near volcanoes, islets, beaches and lagoons, making it a perfect base for seeing highlights within the city and beyond. Julia Eskins is a freelance travel writer and the editor of Here & There Magazine.